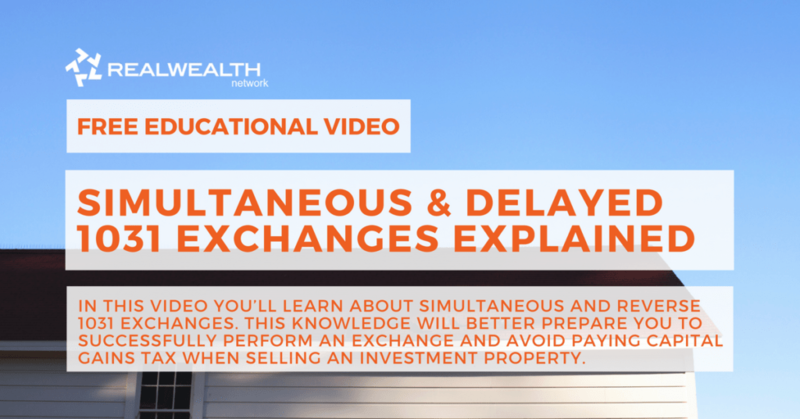 In this video you’ll learn about simultaneous and delayed 1031 exchanges. This knowledge will better prepare you to successfully perform an exchange and avoid paying capital gains tax when selling an investment property. Wie Ming: There are four types of exchanges available to investors and these are the things that again, you want to look at when you’re selecting a 1031 exchange company. First type of exchange available to investor, is a simultaneous exchange. This allows investors to close on their relinquished property and replacement property on the same day. Why do we have this? Well, originally, the 1031 exchange was designed for farmers so that they can exchange the land for areas where they can grow different crops or better crops. That’s what farmers had back in the day, simultaneous exchange. That’s all they had. Nowadays, 95% of exchangers would use the delayed exchange or the standard exchange. This allows investors to sell their property first and then buy a replacement property. The third type of exchange as well as the fourth type, are the more advanced type of exchanges available to investors and not all 1031 exchange companies do them. We at Asset Exchange company do offer these services and these are the reverse exchange. The reverse exchange allows you to buy first and then sell later. The fourth one is the construction or improvement exchange which allows you to use any remaining funds in your exchange account to improve or build upon the property that you’re getting. If you’re buying a property of lower value, you have a couple hundred thousand dollars leftover or 10s of thousands of dollars leftover, you can use that fund to improve or build on it. Maybe a new pool, a roof, whatever it may be. There are actually four basic requirements to do on 1031 exchange, they are the property qualifications, tax deferral requirements, timeline, as well as identification rule. First one– property qualification, your property must have been used for business or investment purposes for at least a year before it qualifies for a 1031 exchange. We recommend to because the longer the better it is for you to have that property as investment or business use property. Why do we say one year? Well, back in the day, the IRS or the government recommended one year before doing a 1031 exchange. That’s a general guideline that we’re going to tell investors. It’s not written into law but that’s what they recommended, so it’s safe to use that as a general idea of how long you need to have your property for as a business or investment property, in order to do a 1031 exchange. In order to do the 1031 exchange, you must also purchase a property of like-kind. Now, this is usually a source of confusion for some investors because they think, “Hey. if I sell a single-family home, I have to buy another single-family home.” That’s not necessarily true, like-kind is actually referring to real estate. If you sell real estate in the United States, you have to buy real estate in the United States. It doesn’t matter if you sell land, it doesn’t matter if you buy apartments, complex, duplex, single-family home, whatever it may be. As long as you sell real estate in the United States, you have to buy real estate in the United States. Now, foreign property is not like-kind. For foreign investors, they cannot sell properties outside of the United States and buy property in and vice versa, that’s not like-kind. For flippers who are simply flipping their properties, those do not qualify for a 1031 exchange either because in the eyes of the IRS, those are just considered inventory, their flips, they aren’t using it for business or investment purposes. Flippers may consider it their business to flip properties because that’s how they’re making a living, but unfortunately, they do not qualify for 1031 exchange. The second guideline is the tax deferral requirement. In order to defer 100% of your tax liability, you must reinvest all your cash and purchase property of equal or greater value to your net sales price. In order to get your net sales price, you take whatever you sold your property for minus non-recurring closing costs. Those are the commission, escrow fees, transfer tax, recording fees, and 1031 exchange fees. These are the fees related to the sale of the property. In this example, this person sold the property for a $1,000,000 at a fee bar expenses of about $100,000 which gives them a net sales price of $900,000. They would then need to reinvest $900,000 or more in order to defer 100% of their tax liability. Now, some investors don’t own the properties free of loan. What happens if they have a loan? Well, that simply means that you get less cash than your net sales price. In this example, the person had a half million dollar loan, had to pay it off when they sell the property and only got $400,000 in cash. Does that mean that they have to only reinvest $400,000? Unfortunately, not. Their net sales price did not change, it’s still $900,000. What they have to do then is use that $400,000 as a down payment and come out with another half million dollars in order to spend that $900,000 reinvestment requirement. Now, it doesn’t matter to the 1031 exchange how you get the money. You can get it via a loan, from your own pocket, borrow from family members, however you get it. What the 1031 exchange looks at is, what is your reinvestment requirement and did you meet that requirement and that happens to be $900,000. Now, what happens if you buy a property lower than your net sales price? In this example, this person needs to spend $900,000 but only bought for $800,000. He has $100,000 left over and that is what we call taxable boot. There’s three steps or three options for this investor at this point. This investor can either go out and buy another replacement property for $100,000 or more in order to satisfy his reinvestment requirement. Or number two, he can take that money and pay taxes on the remaining amount which is the $100,000. General rule of thumb we use, 1/3 that comes out to about a $33,000 tax bill. What’s option number three? If you remember an earlier in the slides, the fourth type of exchange is the construction exchange. The construction exchange will allow the investor to use that remaining $100,000 to improve on their $800,000 property. There are different ways that you can spend the funds. You don’t always have to buy another replacement property. Maybe you want to use that fund to redo the kitchen or whatever it may be. There are options. The third guideline for 1031 exchange is the timeline. This is very, very important because you can’t get extensions for these. From the close of escrow on the sale of your property, you have 180 days to close on a replacement property. But on day 45, you must identify your top choices for replacement property. Asset exchange company provides their clients with what we call the identification letter. It’s basically like a form that lets the investor put down the address of the properties they intend to purchase and identify them. Identify your top choices. Now, you can make as many offers as you want on whatever properties you want before day 45, but you have to nominate your top choices by day 45 and anytime after day 45 you can only go after properties on that list. If you find a property you really like say on day 50, unfortunately, you can’t change your list, you can only call out their properties on your list. Is there any way at all that you can get yourself more time to maybe start looking? Only time that’s possible is if you have a longer escrow period because the timeline for the 1031 exchange does not start until you close escrow. If you have a longer escrow period you could potentially start looking for replacement property when you’re in escrow. It’s the only time and this is 180 calendar days, so don’t expect holidays running things off because that’s not going to stop for you. The fourth one is identification rule. There are two ways you can identify potential replacement properties. The first method is the three property rule. This is usually for investors who are looking to buy no more than three properties. The three property rule allows investors to identify three properties of any value. Again, it doesn’t matter what real estate property you identify, it’s three properties of any value. If you fail to acquire any of the three after day 45 for whatever reason whether or not it’s not long on the market, it burned down or somebody else bought it, unfortunately, your change fails if you fail to acquire any of the three after day 45. If any of the properties fall through before day 45, just put another property on your list, change that list. You can change it before day 45. It’s just that day 45 is the deadline to submit that list to us. Another method that you may want to use is the 200% rule. The 200% rule allows investors to identify any number of replacement properties. Here’s the catch, they can only identify the properties if their combined value is two times or less than the property they’re selling for. Now, this is great for investors who are looking to buy places like Texas or Arizona, where it may be cheaper especially if you sell in California. We’ve had clients sell in San Francisco and buy 10 properties in Texas. Why would they want to do that? Well, as many of you know San Francisco has rent control. Due to the rent control, they may not be getting as much rental income as they would like. What they can do is they can buy in places like Texas where they can get multiple properties and their combined rental income they would get from those would be more than double what you may be getting in San Francisco or places with rent control. They would use the 200% rule. Four guidelines for 1031 exchange, again, I’ll review them. First one’s property qualifications. In order for your property to qualify, it must have been used for business or investment purposes for at least a year and you must also purchase property of like-kind. Number two, in order for you to defer 100% of your tax liability, you must reinvest your net sales price. Number three, you have 180 days from the close of escrow to close on a replacement property and 45 days to identify using either of the three property rule or the 200% rule.